Why have I let so much time pass between visits? That is what I kept thinking as a dear friend and I enjoyed a spectacular dinner at RN74 a few weeks ago. The wine list, under the stewardship of Michael Mina Group Wine Director Rajat Parr, is to die for. Readers will find an abundance of the world’s most coveted bottles, both young and old, for any budget. Where do you start? The Champagne selection includes wines from Cédric Bouchard, Jérôme Prévost, Vilmart, Pierre Peters, Egly-Ouriet and Marie-Courtin. In other words, a who’s who of top-flight growers. In Chablis, diners will find Piuze, Pattes Loup, Christian Moreau in addition to the region’s heavyweights. Colin-Morey, Roulot, (Louis) Carillon and others are tempting in the White Burgundy section. The Loire and Austria are regions I know less intimately, but there is plenty to choose from here as well. Then it is Red Burgundy, and an eye-opening array of wines I rarely see anywhere, like Mugneret-Gibourg’s Gevrey-Chambertin 1er Cru (young vines from Ruchottes) and de Montille’s Malconsorts Cuvée Christiane, another jewel. Many of the mature wines come from the cellar of Wilf Jaeger, a San Francisco-based collector who owns vineyards in Burgundy and also happens to be one of the most knowledgeable people I have ever met, and not just when it comes to Burgundy. We started with Cédric Bouchard’s 2005 La Parcelle Côte de Bechalin. What a Champagne! Rich, vinous and deeply resonant, the 2005 impressed with its balance and sheer class. Wow. This was a great showing. Next up were two whites. The 2010 Guiberteau Saumur was right up my alley. A crisp, energetic and vibrant wine, this superb Chenin Blanc was a perfect foil to the Maitake mushroom tempura, Ahi tuna crudo and grilled Spanish octopus. François Cotat’s 2011 Sancerre La Grande Côte was very good, but a bit too heavy for my taste. Then the real fireworks started. 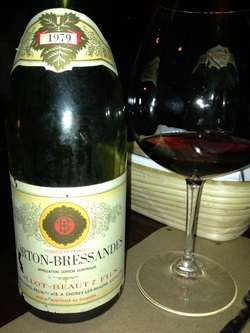 Tollot-Beaut’s 1979 Corton-Bressandes was a revelation. So silky, so pure, so beautiful. It was utterly captivating from the very first taste. Jasmin’s 1982 Côte-Rôtie was also drop-dead gorgeous. Deeply colored, rich and layered, it exuded class and personality. I imagine the 1982 will still be going strong in 20 years, as it has more than enough fruit to run the distance. Both reds were sensational with the arctic char, which was served with steamed mussels, pea tendrils, leeks and white wine broth, a fabulous dish in its own right. The 1996 Williams Selyem Pinot Noir Hirsch Vineyard was in an awkward stage, not young, but also not fully mature either, and just not showing all of its cards...yet. Readers visiting San Francisco own themselves a visit (or two!) to RN74. I can't wait to go back.